Holland has Proportional Representation (PR) and the UK has District Representation (DR). The 2015 UK General Elections under the current DR system have a result that differs dramatically from a PR result, see the graphs here. The Conservatives with 36.9% of the vote get 50.9% of the seats – and given the turnout of 66.1% they only have 24.4% of the electorate. Their only restraint now is the prospect of losing in the next election. In Holland, parties tend to be forced to form coalitions. Compromises tend to make for less extremes. To understand the issue, first check this short paper of mine, that appeared in Mathematics Teaching 222, January 5 2011, the journal of the UK Association of Teachers of Mathematics (ATM). The short paper summarizes this longer more involved comparison of PR vs DR. The Liberal Democrats in the UK want a change from DR to PR. They entered the 2010 coalition also to get the 2011 referendum. Curiously, Nick Clegg selected the Alternative Vote (AV) system. The AV system is needlessly complex and it was duly rejected in the referendum. Nick Clegg might have had more success by proposing a simple PR as in Holland. Now check the following curious point: the Liberal Democrats in Holland – the party D66 formerly known as Democrats 1966 – want Holland to change from PR into DR. Originally in 1966 D66 seems to have opted for the first-pass-the-post DR as nowadays still exists in the UK and USA. Around 2003 they shifted their preference to (something like) the German electoral system with two votes: one vote for the local representative and another vote for the national level to assure PR. This system tends to obscure the true preferences and is often abused to by-pass the 5% electoral threshold, by voting locally for a small party and nationally for a bigger one. Are LDs just being obnoxious ? Answer: The Dutch D66 for 100% and the UK LD for 50%. Do they ever talk with each other ? Answer: Perhaps, but they don’t listen anyway. See below. Why did Nick Clegg in the May 2010 coalition agreement propose the complex Alternative Vote system for the 2011 referendum, while he could have proposed the simpler Dutch PR system and then gained more support ? Answer: There still is that 50% of being obnoxious. Clegg (half-Dutch) didn’t diagnose that his Dutch political friends of D66 are 100% obnoxious. Do the LDs ever study what science has to say on electoral systems ? Answer: Perhaps the UK LD do but the Dutch D66 apparently do not. The point is this: For D66, the plea for a DR started as a gimmick in the roaring 1966s, it became one of their crown jewels, and they never really studied it. Direct election of prime minister and mayors. In reality: direct elections are riddled with paradoxes, see my book “Voting Theory for Democracy“. It is better to have PR for Parliament, and then let Parliament use the more complex systems to select the prime minister (including bargaining). Referenda. In reality: these have similar paradoxes like direct elections, while there is great sensitivity on the exact phrasings, and while the examples of demagoguery abound. It is much better to have coalition government in a PR system, so that decisions can be taken with more information and by representation of the relevant interests. D66 has fluctuated between 3 and 24 seats in a 150 seat Dutch Parliament. They tend to gain votes in opposition and then lose seats when in government, often by showing incompetence. D66 founder Hans van Mierlo (1931-2010) who in 1966 selected the “democratic crown jewels” out of thin air because of his infatuation with the USA, also was foreign minister during the Srebrenica massacre in July 1995 and didn’t resign. D66 seems to have mastered the trick of “seeming reasonable”, by expressing pro’s and con’s of arguments. They put much emphasis on education whence they have some appeal to students. There is always some young face who appeals to reason and more democracy, and who gets some fancy of the public – like demagogues tend to do. Dutch Boris van der Ham, an actor by education and profession, also D66 parliamentarian in 2002-2012 and now chairman of Humanistisch Verbond, explains how the UK LD lost so many seats in the 2015 UK General Elections: see his text in English. The LD went from 23% to 8% of the votes and from 57 to 8 seats. Van der Ham holds that Nick Clegg “took his responsibility” and voters punished him for it. 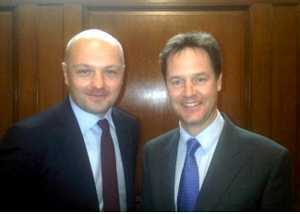 In reality, it is a political debate also whether Clegg promised too much, or was naive, or failed w.r.t. the 2011 referendum as explained above, or made some bad political calculations. Van der Ham is fully silent about the above, i.e. his own responsibility in the communication with Nick Glegg in November 2010 about the important issue of electoral reform. He could have warned Clegg that AV is complex and that there are simpler alternatives. He could also have told Clegg that D66 did not really study the issue scientifically and entertains a bias in favour of say the German DR.
May 13: Since Van der Ham is silent on this, I sent some questions to him, and he replied. His reply allowed me to change this present text a bit from hypothetical to confirmed. Indeed, when D66 would get more than 50% of the vote in Holland, then they might change the current PR into the less transparent German DR system, and use the new-speak that this would be “more democratic”. The Dutch version of Van der Ham’s article on Joop.nl proudly shows his picture with Nick Clegg from November 2010. Here is my response in Dutch, with reference to an earlier article by me on Joop.nl on the math of elections, and here is my pamphlet arguing that reasonable people in D66 should abolish their party for its anti-scientific foundations.